Welcome to Mt. Baker Baptist Association! Mt. Baker Baptist Association is made up of 18 Southern Baptist Church & mission congregations. It is located in the beautiful Northwest corner of Washington State. We are surrounded by the Cascade Mountains to the east and Puget Sound of the Pacific Ocean to the west. Our Northern boundary is the Canada/US border and our Southern boundary is located just north of Seattle, Washington. Currently, our largest church is Oak Harbor Southern Baptist Church located on Whidbey Island, our second largest is Calvary Baptist Church of Burlington, WA. We are made up of anglo congregations as well as ethnic congregations consisting of one Korean church, one Filipino church, one Hispanic church and several Hispanic new work starts. We have an exciting and motivated association of churches with great vision as to what God desires to do here in the Pacific Northwest. The association celebrated its 60th anniversary in 2011 at Skagit Baptist Church, Sedro Woolley, Washington. At one time several churches in British Columbia, Canada were a part of the Mt. Baker Baptist Association. This association was a part of the first work by Southern Baptists to reach into Canada. We still maintain a partnership with WestCoast Baptsit Association, Vancouver, B. C.
The Association Office is located at 710 John Liner Rd. (Post Office Box 191), Sedro-Woolley, WA. 98284. Sedro-Woolley, near the center of our association, is located on the North Cascades Highway. Some links for our Southern Baptist Convention are: www.nwbaptist.org, www.imb.org, www.namb.net, and http://www.sbc.net. Welcome to Mt Baker Baptist Association! Mt Baker Baptist Association is made up of 15 Southern Baptist church congregations and 4 church plants. It is located in the beautiful Northwest corner of Washington State. We are surrounded by the Cascade Mountains to the east and Puget Sound of the Pacific Ocean to the west. Our Northern boundary is the Canada/US border and our southern boundary is located just North of Seattle, Washington. Currently, our largest church is Oak Harbor Southern Baptist located on Whidbey Island followed closely by Calvary Baptist of Burlington, WA. We are made up of anglo congregations as well as some ethnic congregations consisting of two Korean churches, and a Hispanic congregation. As of October 2007 we have four new church starts, one in Marysville, one in Arlington, one in Ferndale, one in Birch Bay. We also have a young couple beginning the process of a church plant in Sedro-Woolley. We have an exciting and motivated association of churches with lots of vision as to what God desires to do here in the Pacific Northwest. 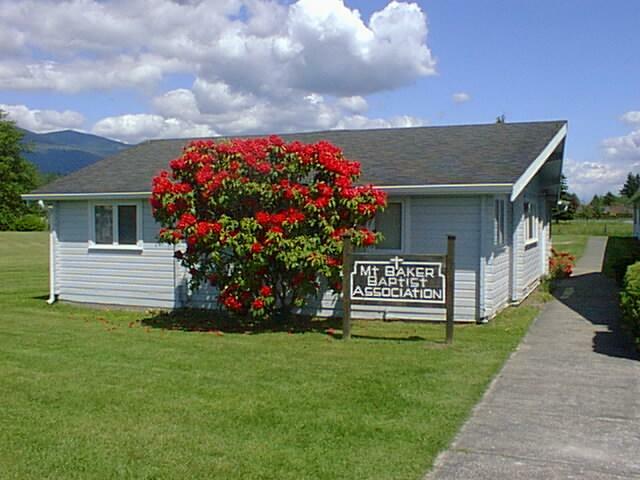 The association celebrated its 50th anniversary in 2001 in Hamilton,Washington which was one of the first churches in the association. At one time several churches in British Columbia, Canada were a part of the Mt. Baker Baptist Association. This association was a part of the first work by Southern Baptist to reach into Canada. The Association office is located at 710 John Liner Rd. [Post Office Box 191] Sedro Woolley, WA.98284. Sedro Woolley, near the center of the association, is located just off of the North Cascade Highway.